This Raspberry Freezer Jam Recipe uses fresh fruit and is quick and easy. 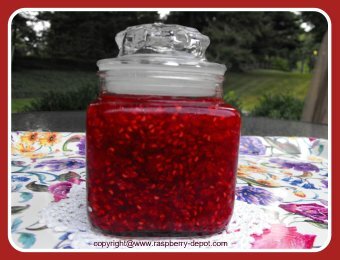 It can be used for both red and/or black raspberries. This jam is not canned or processed, so it needs to be kept in the refrigerator, or, if storing for a longer period of time, store the jam in the freezer until ready to use. Note - if you are planning to remove all or some of the raspberry seeds, then ensure you still have 3 cups of prepared fruit left for the recipe. If desired, process part, or all, of the raspberries through a sieve or a food mill to remove seeds. Place the prepared berries in a large bowl. Let the above mixture stand for 10 minutes, stirring occasionally. Dissolve the powdered pectin in the water, bring to a boil, and boil hard for 1 minute. Add the pectin mixture to the berries and sugar and stir for 3 minutes. Ladle the jam into freezer safe jars or other containers, leaving 1/2 inch headspace. Cover jars/containers and let stand at room temperature until set (up to 24 hours). Freeze or refrigerate the bottled jam. Makes about 7 jars (1/2 pint size).